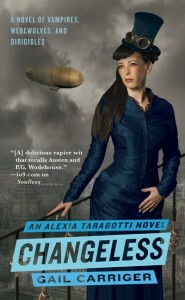 Changeless becomes a New York Times Bestseller! Changeless by Gail Carriger just hit the New York Times best seller list at #20! Whoo hoo!! We’re over the moon over here and hope you share in our excitement! I need to go find a football team so I can practice chest bumping! You can check out the first chapter here or check out the video on how we made the cover for the upcoming Blameless here.